This artfully crafted crystal contains a beautifully engraved personalized message. It is a magnificent loving memento for display. Its a sweet message given by brother to his lil sister showing all love and care towards her. Is it possible to get my design printed on the glass? Yes, we can engrave any design other than the pre-defined ones as well. We will need .cdr file of the design to be engraved. You can drop a mail to contact@dezains.com with your requirement or contact our customer care and we will assist you with it. Is it possible to engrave a picture on the glass? No. Pictures cannot be engraved on this product. Can I get the design in different colour and not white? The design/names are laser engraved on the glass. The appearance of the design will be white in colour. It will not be in colour. Can I get my own quotation printed on the glasses? Sure. 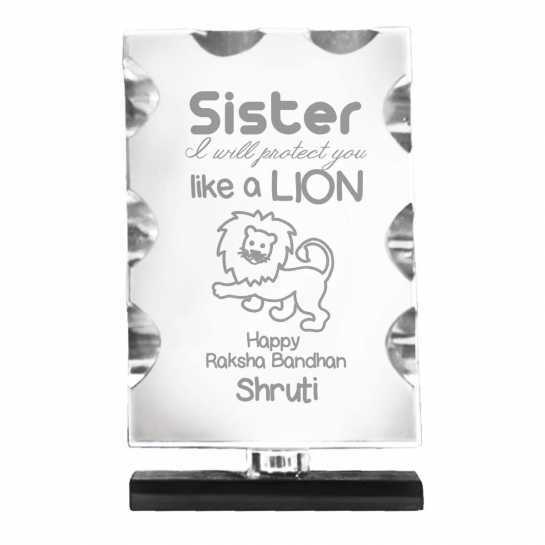 You can customize the names/design as per your requirement. In case you need to change the pre-defined design you can drop a mail to contact@dezains.com with your requirement or contact our customer care and we will assist you with it. Is there any discount if I want to buy these in bulk? Please drop a mail to contact@dezains.com with your requirement or contact our customer care and we will surely help you with the best quotation possible. Material Crystal is exquisitely crafted, featuring quality workmanship of thick, heavy-weight glass with beveled edges on all sides. Engraving Reverse-laser engraving process provides a stunning transparent mirage, creating a magnificent loving memento for display.